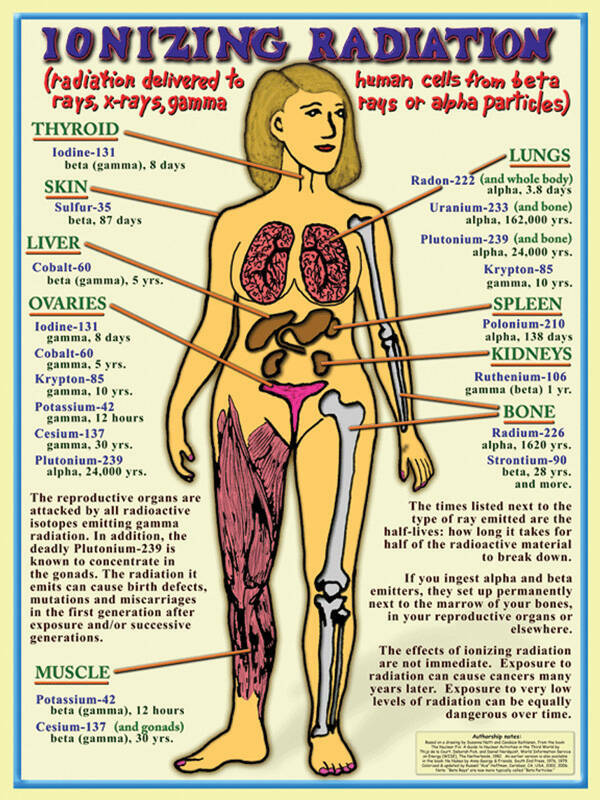 There is no safe exposure to ionizing radiation — the alpha, beta, and gamma and X-rays given off by radioactive materials used in medicine, the military, industry, and nuclear power. The US National Academy of Sciences’ 7th book-length study on the biological effects of ionizing radiation, BEIR-VII, declared that any exposure, regardless of how small, may cause the induction of cancer, birth abnormalities, and/or other diseases. And every US government agency that regulates industrial releases or the medical uses of radiation makes the same warning, based on BEIR-VII. Today the nuclear military-industrial-medical complex is merely required to keep radiation exposures “As Low As Reasonably Achievable.” I didn’t make that up. This uber-vague, tragi-comic standard is not a medical or scientific concept. It is however the formal admission that radiation’s producers cannot keep worker or public exposures to a level that is safe — that is to zero. Exposure standards have been established at the convenience of the vast radiation complex, not by medical doctors or health physicists. During the Cold War arms race, the late Dr. Rosalie Bertell reported in her groundbreaking book No Immediate Danger, “[T]he people with the highest vested interest are the ones that are making the nuclear bombs. And it turns out they have complete control over setting the permissible [radiation exposure] levels. If you were to fix radiation limits at levels that were really protective of human health, you couldn’t get anybody to make bombs.” These corrupt old limits are still mostly in effect today. What the government has declared an “allowable” dose of ionizing radiation has steadily and dramatically decreased over the years — as science has come to better understand the toxic, cancer-causing, mutagenic, and teratogenic properties of even low doses. In the 1920s, the government set the allowable radiation dose for nuclear industry workers at 75 “rem” per year. In 1936 the limit was reduced to 50 rem-per-year; then 20-to-25 in 1948; 15 in 1954, and finally down to five rem-per-year in 1958. This legal dose limit for radiation industry workers is still in effect — in spite of the fact that the International Commission on Radiation Protection recommended in 1990 that these doses be dramatically reduced (again), from 5-rem, to 2-rem-per-year. The US just halted its hapless, industry-opposed, 27-year effort to adopt this precautionary standard. (See last week’s column.) Amazingly, the Nuclear Regulatory Commission (NRC) admitted in the Federal Register that implementing the improvement would be too costly, bowing to industry’s lobby efforts rather than adopt a public health standard the rest of the world embraced decades ago. The general public is officially allowed to be exposed to one-50th of a nuclear industry workers’ radiation dose per year, or 0.1 rem (100 millirem) over a 70-year lifespan. According to research by the Nuclear Information and Resource Service, this allowable, 100 millirem public dose, set by the NRC, imposes a “one of 286” cancer fatality risk standard. That is, fatal cancer given “accidentally” to one out of every 286 people is considered “acceptable,” “permissible” and “allowable” by the federal government. You could call this a license to kill. BEIR-VII found that “radiation at this level to women results in one fatal cancer in every 201 women” — acknowledging that a given radiation dose is far more dangerous for women than for men, and, by extension, that women’s lives mean less to Uncle Sam than men’s. The use of radiation in medicine at least involves the patient’s informed consent regarding the risks. And industry workers can be said to voluntarily accept the risks of workplace radiation exposures. But the public’s involuntary and unbeknownst radiation exposures — via the government’s and industry’s deliberate (and often secret, or misreported, or unregulated, or covered-up) venting, leaking and haphazard dispersal of radioactive gases, liquids and solid wastes — are adding to cancer statistics that grow worse every year. Radioactive emissions from operating reactors, waste fuel pools, fuel and isotope fabrication facilities, unregulated landfills, waste transports, etc., are avoidable, because the industry can be retired, nuclear weapons abolished, and waste sites cleaned up. Call that a national security objective worthy of the military budget. This month, the Pentagon admitted it has used uranium weapons in attacks inside Syria — violating its public promise last year that it would not use DU there, and contradicting the claim that US bombing is done in defense of the Syrian people, according to the Int’l Campaign to Ban Uranium Weapons. Military studies done in 1979, ‘90, ‘93, ‘95 and ‘97, make clear that uranium weapons are chemically toxic, alpha-radiation-emitting poisons that are a danger to target populations and to invading/occupying US forces alike. In spite of this cautionary written record, the military has been shooting its radioactive waste all over the world: into population centers in Iraq in 1991 (380 tons), in Afghanistan in 2001 (amounts unknown); in Bosnia in 1994-‘95 (five tons); in Kosovo in 1999 (10 tons), in Iraq again in 2003 (170 tons); and now in Syria. The Army’s Mobility Equipment, Research & Development Command reported way back in 1979 that, “Not only the people in the immediate vicinity but also people at distances downwind from the fire are faced with potential over exposure to air-borne uranium dust.” This uranium “dust” is generated when DU shells hit and burn through hard targets like tanks or armored vehicles. The uranium is spread for miles by the wind, contaminating everything is its path including food, water, soil, schools, hospitals, etc., and DU is radioactive forever, or ten times 4.5 billion years, whichever comes first. With evidence of its radio-toxicity so clear and redundant, any use of uranium weapons today appears to flaunt the military’s own Field Manual prohibition — absolute and universal — against the use of poison or poisoned weapons. Likewise, the government refused to inform some 600,000 H-bomb factory workers that workplace radiation exposures posed serious health risks, although enough was known about radiation to warn them in 1948. (“N-plant workers not told of risks: Report says US arms program exposed many to radiation,” Associated Press, Dec. 19, 1989) Between 1944 and 1974, “medicalized” human radiation experiments were even conducted on unwitting US citizens, 16,000 of them (The Plutonium Files, by Eileen Welsome). Today, the Pentagon extends this ghastly history into Syria where it is deliberately exposing human beings to weaponized radiation that it knows can cause cancer and other diseases. As if the undeclared, unconstitutional war in Syria weren’t unlawful enough, now add the crime of using poison in violation of military law and the Hague Regulations of War on Land. It is so easy to prove that DU is poison, that a group of four non-lawyers, myself included, convinced a Minneapolis jury in 2004 that AlliantTechsystems’ manufacture of the shells is unlawful enough to excuse an otherwise illegal trespass; our minor offense was justified in order to prevent the greater harm of DU weapons production. Like torture, the use of such poison in war is always criminal, akin to gas war. This latest US government war crime must be condemned in the harshest terms. For more information on DU weapons and the global effort to have them banned, see ICBUW.org. This article was published by Counterpunch on October 28, 2016 and the Duluth Reader Weekly on October 27, 2016. The answer man Donald Trump said August 8 that halting all new federal regulations will create jobs. Notwithstanding the jobs created by implementing new regulations, Trump’s proposal has already been tried by the State of Minnesota, in a retroactive way, with consequences that are predictably toxic to water. In 2015, the Minnesota Pollution Control Agency (MPCA) was forced to abandon its duty to protect state waters from mining runoff after the Legislature passed bills that “essentially exempted taconite mining” operations from complying with the 40-year-old sulfate standard for waters with wild rice — as Mordecai Specktor reports in the August 2016 issue of The Circle. EPA staff are still in the process of conducting an in-depth investigation, so they have neither reached conclusions regarding their potential findings nor communicated them either to WaterLegacy or to MPCA. … I expect that both WaterLegacy and the MPCA will be given an opportunity to comment when EPA has reached the point of preparing draft findings resulting from its investigation. “I believe it is likely that the MN attorney general will respond to EPA’s questions by August 12, since the AG hasn’t requested an additional extension of time. PolyMet’s early pollution projections admitted that acid mine drainage – which permanently destroys surface water systems — from its proposed sulfide mine near the Boundary Waters Canoe Area Wilderness would be a serious problem for over 500 years. Consequently, PolyMet must be legally required to monitor for and clean up acid mine drainage for 500 years. A 500-year cleanup mandate must also be applied to all future follow-on companies that will replace what’s now called “PolyMet.” Changing the name of mining companies is an age-old method of avoiding legal liability. PolyMet’s promises of clean copper-sulfide mining must be backed up with permanent guarantees for monitoring, and waste disposal, cleanup and reclamation no matter what subsequent PolyMet knockoff companies might be named. Of course such a mandate has never been imposed on a mine project and would probably kill the proposal if imposed. This is why the embarrassing 500-year pollution warning has been buried by PolyMet and never appeared in the Final Environmental Impact Statement (FEIS) Nov. 6, 2015. Instead, the company and DNR Commissioner Tom Landwehr use the term “indefinitely.” How can PolyMet be forced to prevent pollution “indefinitely”? This is because PolyMet’s promises are really hot air, and Minnesota’s reputation at a good environmental steward is actually a myth that has never applied to Minnesota mining practices. • Why has there been no independent water modeling required in the environmental review process? Critics point out that all the data and analysis of how much polluted water could drain from the mine site and the tailings site has come from PolyMet. • As Water Legacy notes, “Across the country, there is no example where a sulfide mine has been operated and closed without polluting surface and/or groundwater with acid mine drainage, sulfuric acid and/or toxic metals.” Why has PolyMet been allowed to submit a shabbily supported environmental review based on unsubstantiated claims and faulty data? • The FEIS concludes that it’s “unlikely” acid mine drainage will move north into the pristine Boundary Waters Wilderness, but that if the permanent pollution does flow north (permanently), PolyMet will “fill cracks in the bedrock.” Why is the potential devastation of the Boundary Waters, an otherwise highly-protected national wilderness treasured because of its lack of pollution, allowed to be brushed off with such fatuous gibberish? I’m sure I’m not the first person to howl at that concept of “filling cracks in the bedrock.” The idea sounds like bovine excrement, or like the unworkable “ice wall” being built in Japan to slow groundwater flowing through Fukushima’s three melted reactors. Dominion Virginia Power, a section of the giant utility Dominion, is proceeding unlawfully with construction of its $19-billion-plus power reactor 80 miles from Washington, DC — called North Anna 3 — and must get formal approval from the Virginia State Corporation Commission (SCC) before it can continue, according to a petition filed August 30th by the Virginia Citizens Consumer Council (VCCC; ), a nonprofit group based in Elliston, Va.
On July 12, 2016, Dr. Mark Cooper, senior fellow for economic analysis, Institute for Energy and the Environment at Vermont Law School, also submitted formal comments on behalf of VCCC. Dr. Cooper calls the North Anna 3 project “abysmally wasteful and unnecessary,” concluding that it would cost twice as much as solar to generate the same amount of energy, [and] fatten profits for shareholders by inflating Virginia ratepayer bills by up to 36% (reflecting $6-12 billion in unnecessary costs). On Aug. 23, 2011, the North Anna site was rocked by a 5.8-magnitude earthquake that shook Dominion’s old reactors 1 & 2 twice as hard as they were built to handle. This unanticipated “violation” was the first of its kind in the country’s 60-year-long history of nuclear power, and came six months after the catastrophic earthquake-tsunami-and-triple meltdown in Fukushima, Japan. The Virginia quake moved 25 of Dominion’s outdoor waste casks — that hold highly radioactive, extremely hot waste fuel and weigh 115 tons each — up to 4.5 inches. Not to put too fine a point on the issue, but the $19 billion Unit 3 is being built above an earthquake fault.